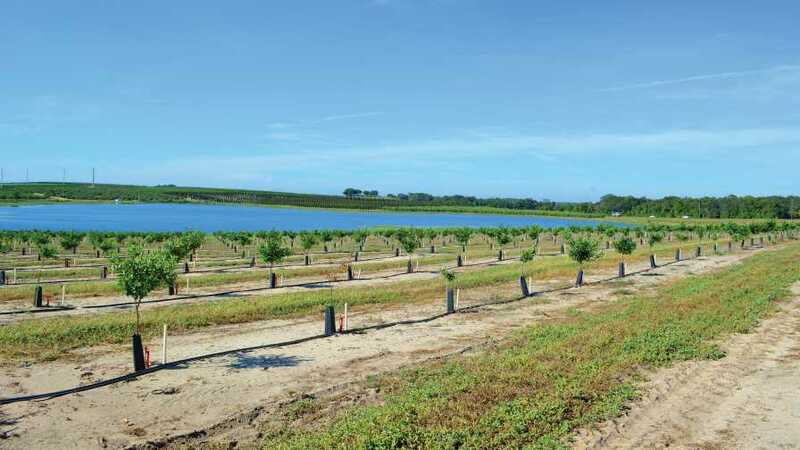 In Lake County, IMG Citrus is putting in new plantings at higher densities of 272 to 303 trees per acre. During the past 20 years, the Florida citrus industry has faced multiple challenges. On the demand side, the introduction of new and alternative beverages to orange juice has increased competition. In addition, consumer concerns and media reports on sugar content in orange juice have likely negatively affected demand, triggering a response from the industry to address them. Changes in consumer lifestyles and diets also have conspired against orange juice consumption. On the supply side, challenges have included the expansion of urban development and a resulting decrease in the availability of agricultural land; the reduction of domestic labor supply availability with its consequent increase in cost; and the introduction of exotic diseases. But, chiefly among all challenges, the industry has been dealing with HLB (citrus greening) since 2005. As trees become increasingly affected by the disease, they suffer premature fruit drop; the fruit harvested is smaller and misshapen; and the juice quality is compromised — all resulting in lower yield. In addition, tree mortality and cost of production increase. In Southwest Florida, production costs for processed oranges, on a per-box basis, have increased from $3.17 in 2003-2004 to $12.71 in 2016-2017 — a 300% increase. During the same period, due to the decrease in supply (and as economic theory predicts), prices per box increased by approximately 200%. The increase in cost relative to price has resulted in a lack of profitability for the average grower, particularly during the last few seasons. As a consequence of the challenges the industry has been facing, production has plummeted by approximately 80% in the last 13 years, causing the industry to drastically downsize at all levels. 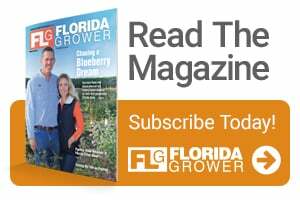 To prevent more growers and infrastructure from going away, and to keep the Florida citrus industry afloat until a cure or management strategy for HLB is found, several public and private incentive programs for replanting are now available to growers. These programs encourage growers to invest in new citrus groves by reducing the initial investment. However, perhaps more importantly, a key question is whether current practices, particularly the typical grove-planting density, are still valid (i.e., profitable) in the current environment. I recently led efforts to develop an analysis that describes the establishment and production costs for a new grove in Florida under endemic HLB conditions for three tree planting densities under different market conditions. Here are some of the key findings. Establishing a new grove with a tree density of 145 trees per acre (similar to the state’s average) was found not to be profitable under current market conditions. Moreover, such tree density only attains a modest return under potential higher prices. Despite the higher level of investment required for planting 220 and 303 trees per acre, analysis shows that under the assumptions and scenarios analyzed, those investments yield higher returns and have the potential to be economically viable. The main driver for the results is that while the costs of higher-density groves do not increase proportionally with the number of trees, yield per acre does. Therefore, planting higher-density groves could offset some of the impact of HLB by decreasing the cost of production per box due to costs per acre being allocated to a higher number of boxes, ultimately resulting in an increase in profitability per acre. Files containing the analysis, assumptions, and results are available at https://crec.ifas.ufl.edu/extension/economics/economic_tools.shtml. Ariel Singerman is an Assistant Professor and UF/IFAS Extension Economist based at the Citrus Research and Education Center in Lake Alfred. See all author stories here.